Although there is no such thing as a curse, it would be fair to say that some people involved with Team USA will be starting to feel slightly uneasy about their passage to the FIBA Basketball World Cup, taking place in Spain later this month and September. There have been numerous injuries and problems with the squad, which has seen many key players being removed from the squad in the lead up to the event. The latest blow to hit the American team in their preparations has been the fact that DeMarcus Cousins has picked up an injury which could see him sitting out of the warmup match versus Brazil. At this moment in time, there is nothing to suggest that Cousins has suffered an injury that would force him out of the tournament. However, there is no doubt that picking up an injury with the squad still to be finalised could see Cousins struggling to make the final cut. At the moment, this is still very much up in the air but when you think about the amount of injuries and call-offs the American squad has already suffered; you have to wonder where it will all end? Another blow to Team USA, albeit one that is slightly more psychological as opposed to physical is the news that FIBA will not allow Team USA to wear patches commemorating Paul George, in official matches. It has to be said that the decision to wear patches seems over the top, players get injured all of the time, and it is not as though George is the only US player to have suffered an injury in the run-up to the tournament which has seen him ruled out. 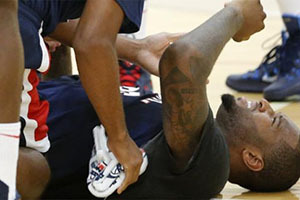 If Cousins was unable to recover from his injury, would Team USA also want to mark the player’s absence with a patch. The reaction of the Brazil squad to Neymar’s injury at the World Cup, akin to the reaction you would expect after a player had passed away, and the Paul George reaction, shows that sporting stars are becoming too embroiled in the need to show their respect at moments like this. It is part of modern culture, with social media leading to a lot more grief and outpouring of emotions, but at times, it can be questioned whether this is the right thing for athletes to do. The Brazilian team at the semi-final of the World Cup looked far more focused on creating a tribute to Neymar than they were on playing the actual game. Germany took advantage of this and provided the host nation with a football lesson that has left them reeling. It is not as likely that any team will hand out a mauling of Team USA in Spain but there is a growing sense of the American attitude not being right for this summer tournament. It can both work ways. The American player may be very motivated to go out and win the event to mark the effort of their fallen comrades, or they could be too motivated or not focused enough on tactics to go and play their proper game. Anyone looking to bet on FIBA World Cup games will have to focus on the motivation aspect of players and whether they are in the right frame of mind to play. Team USA remain the favourites for the 2014 FIBA World but with every passing day, it seems as though there is something else getting in their way.